Have I mentioned we LOVED Tasmania? I think I might have. 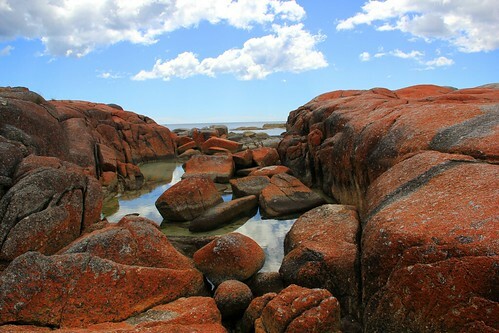 We spent some time camping up near the Bay of Fires on the east coast, and found these huge rocks all along one stretch of shore. The lichen (I’m assuming that’s what it is) makes an awesome red color, that really stood out against the blue sky. A few months ago I posted one of our Uluru sunrise photos. Today we have a more traditional view, the sunset and a clear blue sky. I really expected the rock to turn a very bright red, as per all the postcards…but clearly those have been super photoshopped. Still, it was really lovely. 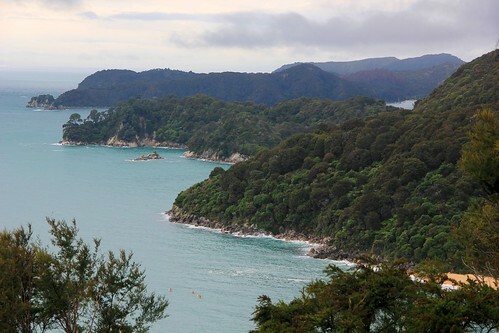 The Abel Tasman trek is one of the easiest ‘Great Walks’ in New Zealand. Most people take 3-5 days to hike the whole thing and camp, or sleep in Dept. of Conservation huts along the way. We didn’t have the time, or the gear for an overnight trek, but we really wanted to spend some time walking in the park. It’s possible to take a water taxi to many points along the track, and walk in either direction. We opted to head to Bark Bay, which is halfway out. We walked the whole way back to town, normally a two day walk if you are camping, but without the gear it’s totally possible in one day. We saw some spectacular coast, and it was well worth the absurd cost of the water taxi, even though we did get rained on for the last 12 kilometers. 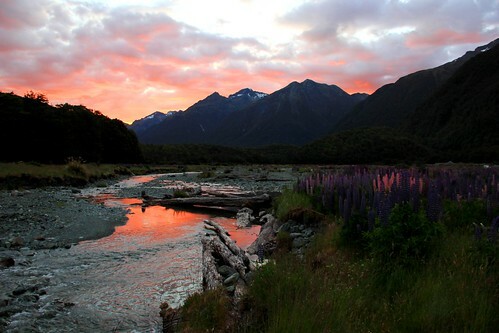 We spent a few nights before the New Year camping at different sites along the road to Milford Sound on the South Island of New Zealand. It was stunning. I think we got supremely lucky with the weather because this area is one of the wettest places in the world and our first three days were full of nothing but summer sun, gorgeous blue skies and sunsets like this. We went for a lot of beach walks on the east coast of Tasmania, and we came across this phenomenon more than once. 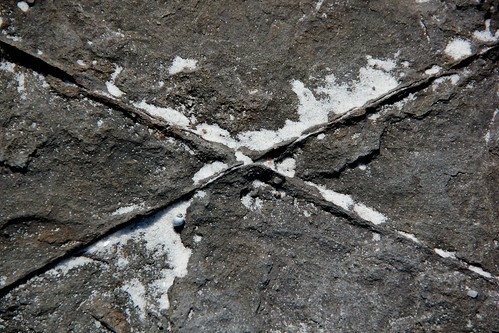 It’s rock, but it looks like paving stones on a street. These are not separate stones! It is one big rock! 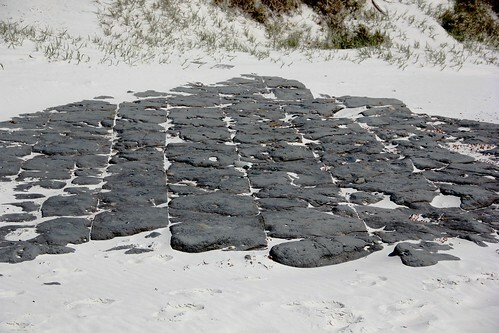 The ocean and the wind does creates a nearly perfect grid system that makes the rock look man-made…but it’s all Mother Nature. 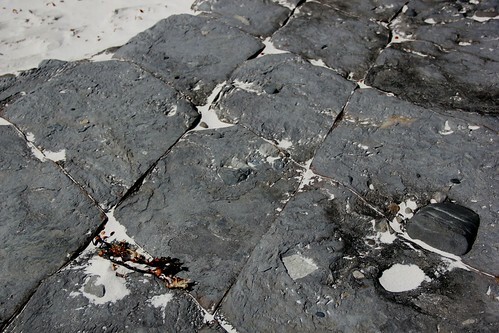 It’s called tessellated pavement. 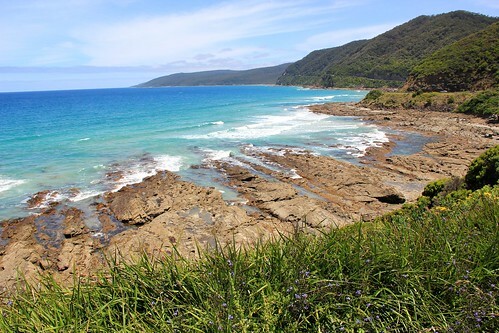 The Great Ocean Road winds its way along a massive stretch of lower Australia and while we would have loved to make a road trip of the entire thing, we had just a day to get as far out on it as we could before heading back to Melbourne. It’s a stunning drive and a place that’s on our ‘must return’ list. If you’re reading this post, then the world hasn’t ended. This is obviously great for many reasons, one of which is that you still have time to head down to Tasmania and check out Cradle Mountain! 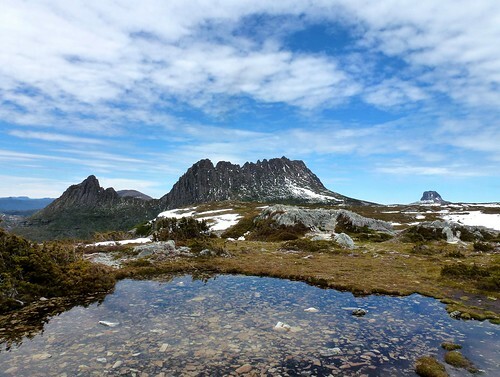 Cradle Mountain is one of the most visited spots in Tasmania, and for good reason. The landscape is dramatic, stunning, and feels very wild. The hiking is some of the most beautiful we’ve done, and felt a lot like parts of Patagonia. It’s a good thing I have a regular Photo Friday, or this blog might have totally fallen by the wayside. We’ve been in Australia since the end of October, and we’ve hardly posted a thing in that time. Here’s where I offer some excuses…Last month, my mom and step-dad, and Justin’s sister came out to travel with us for a while, which means that in the evenings when I might normally be thinking about sorting photos or trying to write a post, we are spending time hanging out and catching up on the year’s happenings. Another thing is the absurd lack of wi-fi access. Honestly I don’t really get it because, hello, even in tiny Indonesian villages we were able to get free wi-fi at most guesthouses or restaurants. Those things aside, well, we’ve been really enjoying our time, and I just haven’t felt much like being in front of the computer. Last week we said goodbye to our loved ones and made our way to Tasmania. It’s part of Australia…you’d be surprised how many people don’t know that. I’m a little ashamed to admit that when a friend of mine came here years ago, I had to look up where exactly it is on the map. 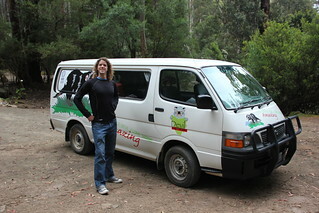 In any case, we’re currently living out of a campervan (which is amazing by the way, totally do this for a while if you ever get the chance) and have been spending most of our time gallivanting around Tasmania’s national park system. We didn’t know much about Tasmania because almost nobody we know has ever been here, so we didn’t really have any expectations other than that we’d heard it was a good place to be hiking and doing other nature-y things. Well let me tell you, our minds have been totally blown by how STUNNINGLY beautiful it is. The landscape combines two of the things we love the most – lush mountains and perfectly blue-green ocean waters on white-sand beaches. Our photos don’t even begin to do it justice, but we’ll leave you with this very tiny slide show for just a small taste. As always, it’s much better if you actually click-through to Flickr and check it out on the full screen setting. 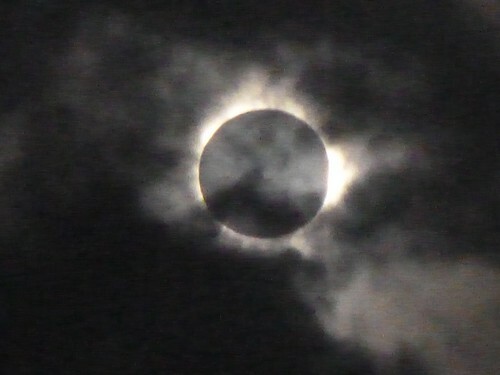 Before we even bought our first flight for this trip, we had promised my mom we’d meet her in Port Douglas, Australia for the total solar eclipse on November 14, 2012. Honestly, I would never even have known it was happening, but the timing worked out well since we wanted to be in Australia and New Zealand for this summer. 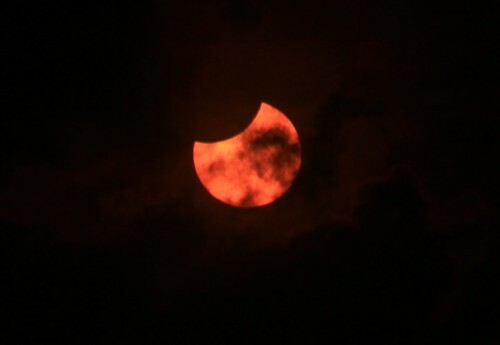 I remember seeing one partial eclipse as a kid, but this was before the days of disposable eclipse viewing glasses so all I really remember is constructing those little cardboard viewing boxes and seeing the shadow they created. This time around we were armed with multiple pairs of glasses, including the extra sets we used to cover our camera lenses with. Interestingly, the only time that you don’t need the glasses is during the ‘totality’ when you can look at the ring of light directly. 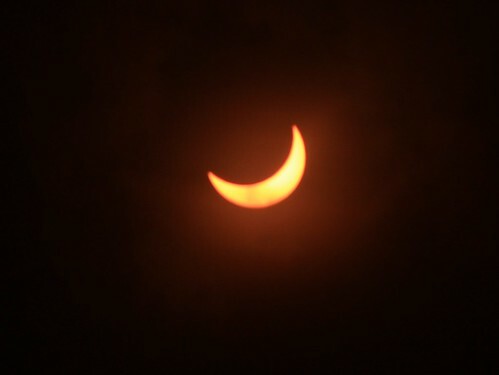 It had been cloudy and raining the two days prior to the event, and we were very worried that we wouldn’t get to see it all happen. 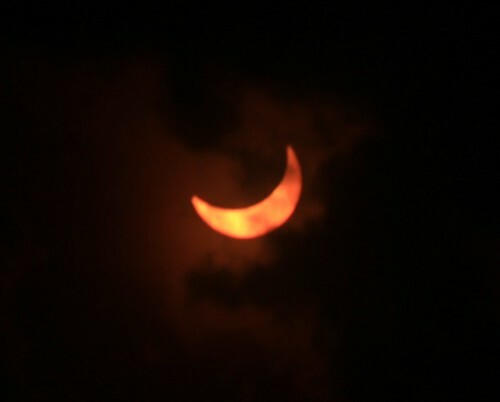 Fortunately the morning was only partly cloudy and even though our view was obstructed sometimes, we did get to see many phases of the eclipse, and we even got a shot of the totality before the clouds took over. The most amazing thing was the eerie silver appearance everything took on just before the drop into darkness that comes with the totality. It was easily one of the more spectacular things we’ve seen and we’re excited that there will be one crossing over North America on August 21, 2017. 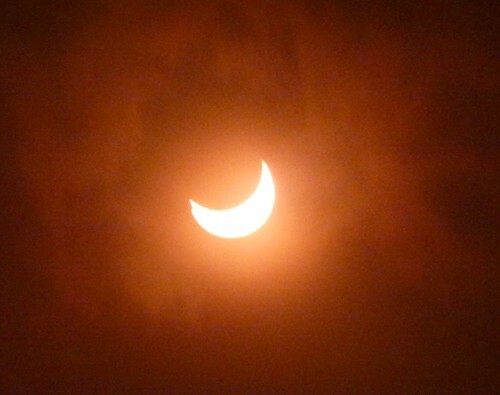 Total eclipses occur nearly every year, but are only visible within a narrow corridor, and not on every continent. 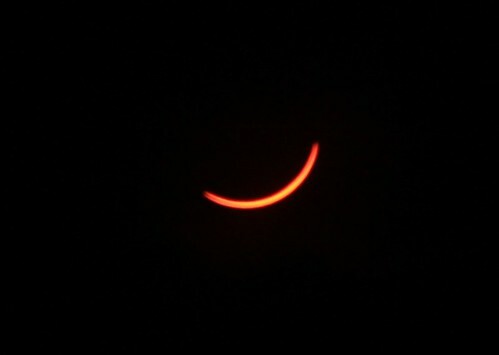 For more information check out NASA’s eclipse webpage. The professionals get much better shots with their giant lenses and official eclipse lens covers (as opposed to say…taping a pair of cardboard eclipse glasses over the lens of your camera…not like I know anyone who did that…) but you get the idea with these. Totality. This looks like it was taken in black and white, but it wasn’t. We spent last week trying not to dehydrate in the Outback of Australia. 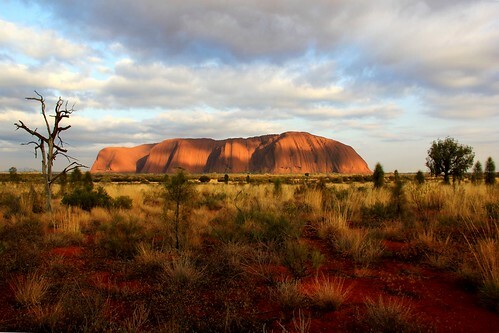 Much of our time was taken up with hanging around Kata Tjuta and Uluru (commonly known as Ayers Rock). 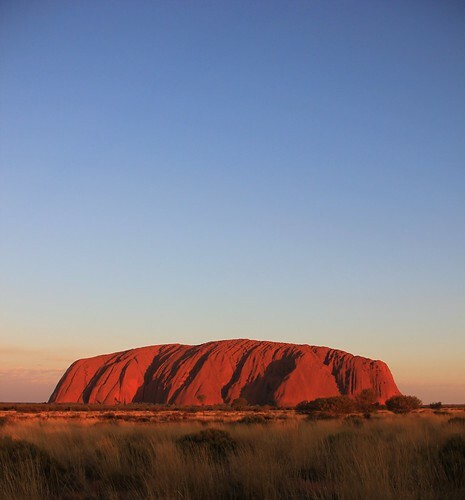 The most famous photos of Uluru are taken at sunrise or sunset when the light makes the sandstone into a beautiful glowing spectacle. After 6 months with no real rain to speak of, we arrived in the area just in time for some serious thunderstorms. 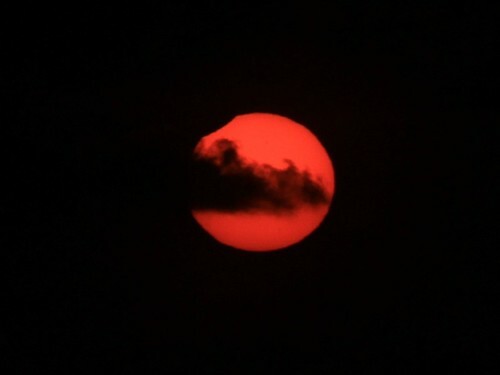 Fortunately the rain poured overnight and left a lovely scattered cloud palate for one of our sunrise views.